Finn did so great last night, snuggling in the bed with me and just generally being cute. He woke me up about 6am to go outside, then we went back to bed until almost 10am. No accidents in the house yet, and he seems to already know “sit.” Today we went and got a car seat, then stopped by to meet with my parents. Then we went to pick up Captain, Allison’s dog. He is a sweet Cavalier and he seems to like being at my house. He and Jackson are wandering around a bit in the family room, the cats are sleeping on the couch, and Finn and I are also cuddling on the couch. I think it might be time for a little snooze. I am glad Finn is adjusting well to his new home. 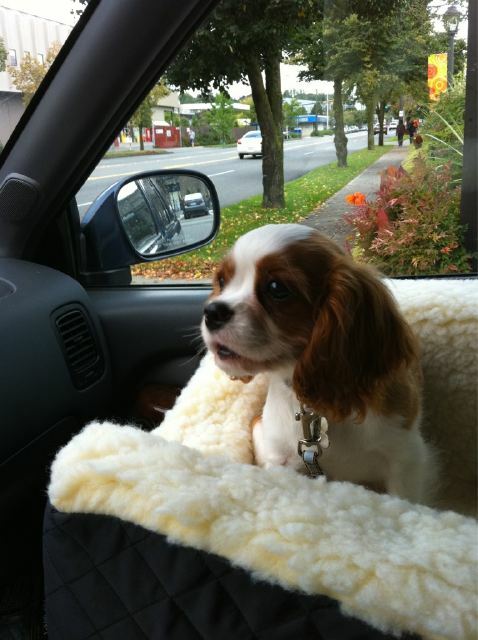 Love his car seat- what a comfy ride!